UPDATE: In a hat tip to modernity, Club100 Retro adds a SuperHeavyweight Class. Do you remember the 90s? The decade before before The Facebook. To begin with music still came on CDs, by the end everyone knew what an iPod was. It began listening to “World in Motion” by New Order and Grunge while Britpop was passe by the time we entered the noughties and after panicking about the millenium bug. Kerry Dixon had started the decade playing up front for Chelsea, back in the old First Division, and ended with manager Gianluca Vialli lifting the FA Cup and still no one had heard of Roman Abramovich. Playscape launched Club100 in 1993 with a 6 round mini Sprint Series at Buckmore Park, managed by John Vigor and around Club100 “social media” in the 90s meant a monthly newsletter, sent in the Royal Mail. This year to commemorate our 25th anniversary year, we are going back to our roots, back to the source, for one Sunday only! During the late nineties and early millennium years the sprint championship consisted of two weight categories, Lightweight and Heavyweight. No Elite, no Premier or Clubman classes back then! No qualifying formats back then either. Just a straight 3 heats and a final. Everyone arrived in the morning and spent the full day in a more relaxed and sociable atmosphere. On Sunday 16the September we will roll back the years with Club100 Retro Style! The ‘O’ Plate is for open, an event open to all comers, with no club registration fee to pay. A ‘one off’ event available to all. Our current sprint minimum racing weights will apply to this event. LW @ 78Kg. HW @ 90Kg. A Super Heavyweight Class will be run within the HW grids, set at 98Kg. 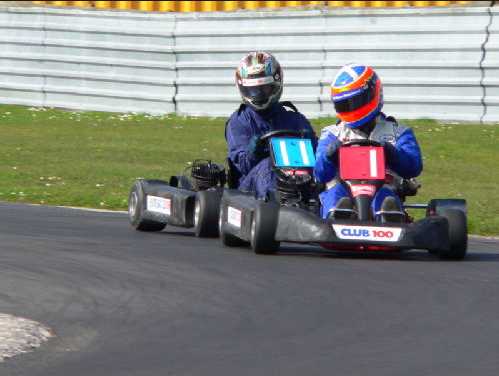 The outright winner of each class shall be crowned the ‘O’ Plate Champion and will be eligible to sport the ‘O’ plate on their kart for the remainder of the season and 2019. Prizes will also be awarded to the winners of every final. The second and third rounds of 3 heats per class with heats 4 to 9 and will be 7 mins each in each class. Each driver will compete in 3 heats and is guaranteed 1 final. Into the finals, and continuing the alternating theme. If you are interested in this very special event, tell your friends and come and join us for a full days racing. All we require at this stage is a £15 deposit to confirm your entry. With the balance payable on 31st August.